Anti-fatigue mats can help ease pain at work. Worker fatigue is a very real problem, particularly in professions where people need to be on their feet for most of the day. 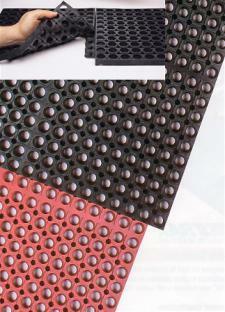 Anti-fatigue mats can help, as they cushion the pressure joints typically feel on hard surfaces from standing. However, it’s important to ensure that fatigue isn’t having too strong of an effect on your workforce. Material Handling and Logistics reports it’s critical for warehouse managers to look at the fatigue levels of their employees and make sure no one is slipping. Warehouse employees and manufacturers alike are typically at risk for experiencing fatigue while on the job, given the labor requirements and hours. The news provider suggests monitoring productivity levels of workers doing the same tasks and see where it starts to dip off. With the latest in technology innovations, it’s easier to monitor to see how employees are performing throughout the day. The National Institutes of Health reports worker fatigue can actually affect your bottom line, as employees who are tired may increase their chances of making a mistake and then injuring themselves on the job, resulting in missed work and compensation. It behooves managers to pay attention to employee fatigue levels and keep them in check. Next PostNext When it comes to working, is it better to sit or stand?